A small and vigorous dog that does present substance in a small package. An exceptional herder and precious companion. These loving creatures have gained tremendous popularity in recent years for many reasons. As a smaller canine, they are not a nervous or hyper dog, but low key, hardy and beyond question, they are extremely cute. 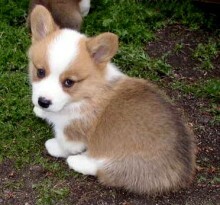 Corgis fit into a variety of lifestyles and are great traveling companions. Due to their wonderful intelligence and nature, they excel in obedience which makes them the very essence of companionship. Though their origin is working cattle, I have greatly enjoyed their help tending my Angora goats. It is easy to end up with more than just one of these little dogs as they create quite a passion ......the Corgi passion. We love our little dogs. They are helpful with the animals, companions beyond words, and always offer a cheerful and happy presence. I love the size of these dogs when it comes to working with the goats and sheep, as they are the perfect dog for the task. Gentle and yet demanding with the livestock, they love being out helping.... always striving to please. 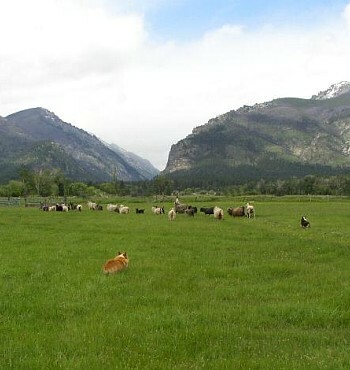 Our breeding Corgis have impressive Champion pedigrees and original old-world farm names. Our dogs have it all, wonderful showy looks and markings, impressive pedigree, and great herding instincts. Growing our puppies requires a great deal of time. We like to introduce them to as much variety as possible to help them prepare for the new home they will eventually find themselves in. They are very well socialized by the time they are ready to go. We spend a great deal of time acquainting them with other farm animals, other dogs, cats, and lots of children and people. It is always enjoyable to see how early their herding instincts develop. This breed is an irreplaceable asset to our farm.